Glen Coe, before the first snows of winter. Much of Scotland's early recorded history is full of violence - battles, feuds, murders, treachery. But the incident which to this day still arouses the strongest passions was the massacre of the MacIans (a sept of the clan Donald) in Glen Coe in 1692. It was not just the fact that 38 people were murdered by government troops, led by Captain Robert Campbell; it was the unforgivable sin that Campbell and his men had enjoyed the traditional Highland hospitality before turning on their hosts (who included his own niece and her husband) in an attempt at what today would be called "ethnic cleansing." Three hundred years later, Campbells still suffer the opprobrium of the massacre. Generations of Scots children have been taught "never trust a Campbell." At the start of the 17th century, the Union of the Crowns in 1603 should have heralded a period of peace after centuries of war between Scotland and England. At last, without any further fighting, the two countries were united under one monarch, King James VI of Scotland. But as the century wore on, the Stewart kings failed to recognise the changes taking place in their country. King Charles I was convinced of the "Divine Right of Kings" at a time when parliamentary democracy was becoming stronger and he also pushed the cause of Catholicism as many of his subjects, both in Scotland and England, were adopting forms of the Protestant faith. The result was the Civil War of 1642-46, (in which large numbers of Scots supported the king), the beheading of Charles I and the "Commonwealth" of Oliver Cromwell. The monarchy was later restored under Charles II but when he died in 1685, the Catholic faith of his brother, King James VII, was a factor in the uprising by the Duke of Monmouth (assisted by the Earl of Argyll in Scotland). While that was unsuccessful, the arrival in 1688 of King James' nephew, the Calvinist William of Orange, forced James to flee to France. But, as was shown by the Jacobite Uprisings in 1689 under John Graham of Claverhouse (Viscount Dundee with a force mainly drawn from the Highland clans) and the deposed King James' defeat at the Battle of the Boyne in 1690, there was an ever present threat. In August, 1691, King William III offered a pardon to all the Highland clans who had risen against him in earlier years but only if they took an oath of allegiance before 1 January, 1692. Alastair MacIan, 12th Chief of Glen Coe (who had joined Claverhouse in 1689), despite the four months notice, left it to the last minute to take the oath. This was because, like many other Highland chiefs, he waited for the approval of the deposed King James VII - which was late in coming. 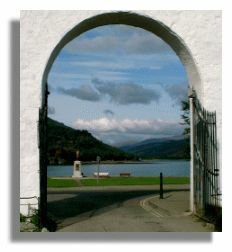 But he compounded this by going to the wrong place to take the oath and arrived at Inveraray (pictured here), after a dreadful journey through the snow, too late to take the oath by the deadline. The government had been waiting for just such an the opportunity to "make an example" of anyone who stepped out of line. The fact that it was this section of the clan Donald, was considered a bonus. Over the years in the "Wild West" atmosphere of the Highlands, they had done more than their fair share of raiding and thieving. In the famous Atholl Raid of 1685 (after two successive Earls of Argyll had been executed and the Campbells, for once, were weakened) the Glen Coe men, with others, took advantage of the situation to pillage huge tracts of Campbell territory. "You are hereby ordered to fall upon the rebels, the M'Donalds, of Glencoe and putt all to the sword under seventy. You are to have special care that the old fox and his sons doe upon no account escape your hands. You are to secure all the avenues, that no man may escape.... This is by the King's special command, for the good of the country, that these miscreants be cutt off root and branch. See that this be putt in execution without feud or favour, else you may expect to be treated as not true to the king's government, nor a man fitt to carry a commission in the king's service. Expecting you will not faill in the fulfilling hereof as you love yourself, I subscribe these with my hand. Master of the Stair (John Dalyrmple)." 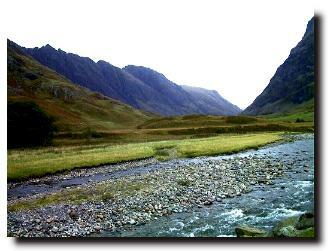 On 1 February 1692, two companies of red-coated government soldiers (about 120 men, of whom only around a dozen were Campbells) were sent to Glen Coe. The commander of the government forces sent to Glen Coe was Captain Robert Campbell. He was 60 years old and through drink, bad decisions and loss of property arising from the Atholl Raid seven years earlier, had been forced to take up a commission in the army. He was, however, welcomed to the glen and he and his soldiers were sheltered and fed amongst the various cottages in the area. He was well-known to the MacIans and was related through marriage. But his orders arrived and at 5 a.m. on the morning of 13 February, he and his redcoats set about carrying out their orders. Whether due to incompetence or some of the soldiers not being enthusiastic for the task, "only" 38 men, women and children out of the 200 of the clan were killed (though others perished later on the snow-swept hills as they tried to escape). Some were shot in the back and the rings from the hand of chief's wife were hacked off - she died soon after. While the chief was also amongst the dead, his two sons escaped, possibly helped by the late arrival, due to a blizzard, of an additional force of redcoats, which should have blocked the entrance to the glen. The Lord Advocate was disappointed that the entire clan had not been exterminated. Gradually the MacIans drifted back to Glen Coe and the Scottish Privy Council granted them protection - under the patronage of the Earl of Argyll, a Campbell. John the 13th Chief of Glen Coe was formally allowed the king's pardon and rebuilt the family home. But the story of the atrocity began to circulate in Edinburgh and London partly as a result of Captain Robert Campbell leaving his orders in an Edinburgh bar while drunk. Of course, the Lord Advocate had many enemies who were only too pleased to stir things up. In 1695 a commission was formed which noted that others who had been late in taking the oath had been excused. King William had demanded that the MacIans be "extirpated" but this was said to have been taken too far by the Master of Stair who was deemed to have exceeded his authority. But Stair was never brought to trial, and though he was forced to resign, soon returned to politics - and was one of the chief architects of the Act of Union in 1707. A descendant of Robert Campbell, the officer in charge of the troops, has written the first official clan history, a three-volume work which argues that the Campbells should no longer shoulder the blame for the massacre. He writes that the officer in charge was following orders which he had to obey, on pain of death. He also points to the official enquiry which later looked into the massacre and which clearly showed that the orders for the massacre had been issued by the John Dalrymple, Master (later Earl) of Stair who at that time was Lord Advocate, the chief legal officer in Scotland. But the retelling of the story will undoubtedly stir up a hornets nest and a lot of recrimination. In such situations, facts and truth are often the first victims.